The draft programme is available by clicking on the icon below. We’re sorry registration is now closed! Costs & Quality - Is higher punctuality more costly? This page will display all public deliverables and documents. Seven case studies have been selected, covering the three business cases considered in the Project: busy routes, underutilized secondary lines, and freight-dominated routes. Slovenia and Turkey provided all three cases, whilst the Romanian case studies were limited to just a secondary line. A good availability of technical, financial and operational data, pertaining to the infrastructure and operations. 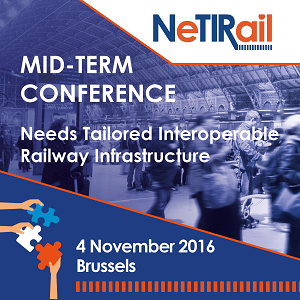 The overall purpose of NeTIRail-INFRA is to identify interventions that will reduce costs for maintaining railway lines as well as improve quality of services. More specifically, the idea is to identify interventions that will reduce costs for infrastructure condition monitoring and maintenance at the same time as overall performance is improved. The first task (T1.1) in WP 1 – Contrasting market needs, and business case – was to select case study lines which fit the three line categories set out in the application. These are busy capacity limited passenger railway; under-utilised rural/secondary lines; and a freight dominated route. Seven case study lines were selected that fit these three line categories from countries with industry representation in NeTIRail-INFRA (Romania, Turkey and Slovenia). The present deliverable concerns task T1.2. The purpose of this task is to start identifying and collecting relevant economic information about the selected case study lines. As noted in the description of work, the data needed for assessing the impact on costs as well as on reliability, capacity and the environment will be in focus for the relevant technical work packages. T1.2 therefore primarily identifies the nature of the interventions addressed in WP2, WP3 and WP4. Based on this description, the need for economic information and related data is specified. In addition, collection of information about demand (number of users etc. on the case study lines) has been initiated. This is an important statistic for computing user benefits of technical infrastructure improvements. The collection of demand data has proceeded according to plans. There is, however, still some scope for improving the understanding of the precise interventions that are being considered in each technical work package. This must then be combined with a mutual understanding of the type of information about costs and related information, such as interventions, delays and failures that will be needed in order to implement a comprehensive understanding of the impact of each intervention. Ultimately, such information will be required if we are to demonstrate the overall net benefit of the innovations and thus establish the business case. The production of D1.2 has generated a strategy for closing this gap: As part of WP1, an example database has been produced that comprises data from another country (Sweden). This template will be used in the next phase of to communicate requirements within the consortium and to identify similar information for each case study line. 1. The development of a high level strategic cost model that will draw life cycle cost (LCC) information from the technical work packages (WP2-WP4) and incorporate them within a cost-benefit-analysis (CBA) framework to establish the business case for the relevant innovations. 2. 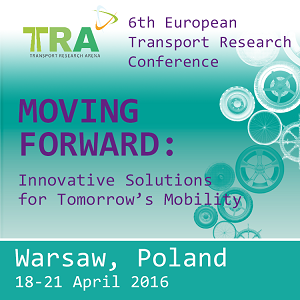 Econometric modelling aimed at pushing forward the research frontier in the area of rail marginal cost estimation. In addition, qualitative research will be carried out in the area of incentives: that is how different incentive mechanisms (track access agreements, franchise agreements, performance regimes and the wider regulatory and government funding regimes) operate and interact / contradict. In respect of the high level strategic cost model, the inputs required will derive from the LCC analysis that will be done within WP2-WP4. It is therefore very important that there is close interaction between WP1 and WP2-WP4 to ensure that the required information is provided. The LCC will consider how maintenance practices and asset lives will change as a result of the proposed innovations, such that an estimate of costs, with and without the innovations (and with different assumptions about future traffic and service growth) can be estimated. These cost estimates will be integrated within the overall cost benefit analysis (CBA) framework to establish the business case. The data gaps established in Deliverable 1.2 will need to be closed and the first step is a session at the Consortium meeting in Istanbul in July 2016. One important consideration at that meeting will be the extent to which the involvement of staff involved in costing / budgeting within the railway organisations might become more closely involved with the project. In respect of the econometric research, an ambitious research programme has been set out. This will feed into the high level strategic cost modelling by providing a high level cross-check against the bottom-up engineering LCC analysis, and also for scaling the results (e.g. making estimates about how costs change with increased future traffic levels). It also pushes forward the research frontier in a number of areas: (1) cost variability with respect to quality and climate; (2) the impact of aggregation of datasets on marginal cost estimates; (3) and methodological aspects relating to functional form and obtaining improved estimates of cost elasticities and marginal costs1 . Whilst the research is ambitious, datasets have already been collected from non-case study countries (due to lack of data in the case study countries). Preliminary literature reviews have been carried out. methodological framework utilised for this task. Task 1.4 (Wider Economic Benefits) in NeTIRail-INFRA is concerned with the development of tools required to estimate the wider economic impacts of the case study rail lines. Before wider economic impacts can be valued in a cost benefit analysis it is necessary to predict the scale of the impacts on the economy – e.g. in terms of productivity, employment and output. The estimation and valuation of these impacts will form part of the business case for the innovations developed in work packages 2, 3 and 4 and will where possible be incorporated into the decision support tools being developed in WP6. The purpose of this deliverable is to identify the evaluation studies and the econometric methods to be used in estimating the relationship between historic rail investment and changes in employment. The results from evaluation studies will be used to support the estimation of the wider economic impacts of the case study lines in WP1. The literature is developed in the context of changes in productivity and output and chosen supporting models for economic output, productivity and the valuation methods for all the economy impacts will be described in the subsequent deliverable associated with this task. However, the literature remains fairly embryonic in terms of estimating employment impacts from changes in transport quality. This task addresses this evidence gap and involves the development of a model regarding the relationship between rail infrastructure and employment–focused around the NeTIRail-INFRA interests (busy commuter line, low trafficked line and freight line in the East European countries Slovenia, Romania and Turkey). Having reviewed data availability and historic rail investments, we find there to be insufficient potential evaluation studies in the three case study countries and here we describe the methods used to create a long list including additional historic investments in Sweden and the UK. We then describe how we have whittled these down to a short list of seven evaluation studies covering the three NeTIRail-INFRA line types (busy commuter, low trafficked and freight). We explain how the effect of these investments on employment will be evaluated using a “Differences in Differences” evaluation method and the reasons underlining this choice of approach. Finally, we set out the remaining steps of Task 1.4. The overall aim of this deliverable is to set out the methods to quantify and value the wider economic impacts of the NeTIRail-INFRA interventions which form the basis of the business case for the case study lines in task 1.6. 2. The development of a model to quantify the relationship between rail infrastructure and employment focused around the NeTIRail-INFRA interests (busy commuter line, low trafficked line and freight line in the East European countries Slovenia, Romania and Turkey). 3. The presentation of appropriate valuation methods for all the economy impacts as derived from a survey of the literature. Before wider economic impacts can be valued in a cost benefit analysis it is necessary to predict the scale of the impacts on the economy – e.g. in terms of productivity, employment and output. This is the quantification stage and is addressed through objectives 1 and 2. As part of this process we identify the market failures that are relevant to the analysis, as this determines the scope of the wider impact analysis to be employed in the NeTIRail-INFRA case studies. Through objective 2 this deliverable also addresses one of the main evidence gaps in the quantification of wider economic benefits – that of quantifying the employment effects. Within this deliverable we present new evidence on the relationship between rail infrastructure and employment. Whilst we were unable to identify suitable historic investments within all the NeTIRail-INFRA area of interest, we proceeded with a detailed examination of four historic rail investments: Murska Sobota- Hodos (Slovenia), Mansfield to Nottingham - the Robin Hood line (UK), Manchester metro (UK) and Stirling to Alloa (UK) which covered busy commuter lines and low trafficked lines. Our analysis of these case studies in this deliverable has given interesting but mixed results. We do find evidence of employment impacts in certain contexts but these have been hard to interpret in the context of the NeTIRail-INFRA innovations and thus objective 2 is not entirely met. This deliverable nevertheless sets out the principles for quantifying employment impacts based on existing evidence and guidance necessary to estimate such effects where relevant for the innovations, utilising the general evidence from the literature as well as the new econometric work undertaken. In order to fully address objectives 1 and 3 related to the quantification and valuation stages we have transferred models used elsewhere to capture the agglomeration impacts and imperfect competition effects. Suggested model parameters pertinent to Eastern Europe have been drawn from the literature and presented to give a set of models that can be used to estimate the wider economic impacts of the NeTIRail-INFRA innovations when tested in the case studies. This deliverable draws together a significant body of research undertaken as part of the project. This deliverable synthesizes and brings together all the elements of the economic and social assessment of the NeTIRail-INFRA railway innovations, which have been developed in previous Deliverables D1.4, D1.6, D1.7, D5.2 and D5.3. Hence, this deliverable brings together the Cost Benefit Analyses (D1.4), the societal analyses (D5.2 and D5.3), the wider economic impact research (D1.6) and the investigation on incentives for the implementation of innovations (D1.7). 2) their detailed application into practice. Although we observed that both RAMS and LCC are considered powerful tools these are not fully understood hence their development is slower than anticipated. We highlighted the fact that due to the limited number of available databases containing RAMS indicators, progress towards a unified European/ International system is still slow. Furthermore, lacking a clear RAMS programme plan, RAMS analyses are not carried out in all life cycle phases hence, lacking full RAMS-LCC integration. Generally speaking, there is higher propensity to consider inputs deriving from either track tests, meetings and questionnaires and past faults to carry out RAMS analyses which leads to a need to fully systemise RAMS in railway infrastructure. Undeniably a RAMS and LCC analysis allows the optimisation of the maintenance strategy and allows to shorten decision times regarding maintenance/renewal. Even more interesting is the fact that any RAMS-LCC analysis indicates the consequences of under budgeting maintenance and renewal. This is why we conceptualised our own database starting from cost components to define the database structure and RAMS-LCC integration to define some database relations. This data analysis task builds on existing rail industry datasets in two ways: (i) Addition of data from NeTIRail-INFRA countries and line types that have not been collected previously, and (ii) Through application of Geographic Information System (GIS) mapping to the failure data to reveal correlations and underlying drivers of cost and maintenance which have not been previously visible. Based on the data collected and available so far in the database we provide several basic descriptions of the data by presenting the main statistics in terms of costs, failures and traffic volume. Various cost categories, failure type and incidence and, traffic volume information are presented in a comparative manner across case study lines. These first level analyses are accompanied by a correlation analysis performed on an aggregated country level and individual line level. In recent years, the amount of traffic that the railways have to carry has increased and this is expected to continue into the future, combined with higher speeds has meant that the duty conditions of rail have become more severe. In this report are presented the main components and activities of a railroad network. Described are the achievement and installation possibilities which have the highest efficiency and reliability. Among the variants of existing technologies and solutions in different geographic areas, comparisons are made and those that proved the best results are highlighted. They address issues regarding the components and technologies used in the three main stages in the life of the railway line: installation, operation and maintenance. For existing lines, the focus will be on the operational activities and maintenance, while for completely new installations or significant rebuilding are described multiple technologies and technical solutions as, their implementation in these conditions, are possible and necessary. Information and results from previous projects conducted in this area of application, including the InnoTrack and Mainline Project, will be used. The three categories of railway lines (busy passenger line, low density rural / secondary line, dominated freight route), need to be analysed in the project, and were identified as real lines. These lines belong to the infrastructure managers involved in the project and will complete a list of case studies. T2.2 has benefited from the analysis result of T1.1. This task was completed in the fourth month of the project and defined, after a strict selection, a list with seven lines that may be included in the three categories as defined for the purpose of analysis and improvement in the NeTIRail Project. All these lines contain common characteristics that made them candidates for selection. For Slovenia, SZ selected railway lines were: Divaca - Koper (as freight dominated route); Pivka - Ilirska Bistrica (as low density rural / secondary line); Ljubljana - Kamnik (busy passenger line). For Romania, from RCCF-Brasov, was selected the railway line Bartholomew - Zarnesti (as low density rural/ secondary line). For Turkey, INTADER selected the railway lines: Kayas - Sincan (as busy passenger line) Divrigi - Malatya (as low density rural / secondary line) Malatya - Iskenderun (as freight dominated route). Existing components and practices used in the operational and maintenance activities for the case studies, covering all the three categories of lines, have been analysed and solutions to improve the current situation have been proposed. This report provides a collection of items that will be useful for applying analysis of lean and automotive techniques in railway switch and crossing (S&C). The data used in this deliverable were collected from various source, including real data from IMs, datasheets from infrastructure manufactures, scientific publications (journal, conference and workshop articles, research reports, dissertations, etc.). Some comparable data are organized in the form of figures and tables. Other detailed data in the form of spreadsheet or pictures are also attached with this report. This report also provides the data regarding S&C characteristics, additional fittings for S&C, fastening system and maintenance tasks for S&C, and some new techniques that may improve the performance of S&C and/or optimize maintenance procedures. Climatic conditions along NeTIRail-INFRA case study lines that impact S&C performance. These data will be mainly used in Task 2.3.2 (Application of lean and automotive industry techniques to railway S&C) of the NeTIRail-INFRA project. Based on the data collected in T2.3.1 and additional inputs (technical visits, state of the art, etc. ), firstly this report provides an overview on the main features pertaining to safety in general and RAMS analysis (Reliability, Availability, Maintainability, Safety) of S&Cs. Then, the application of lean techniques and automotive techniques will be demonstrated as applied to S&C renewal activities in accordance with a number of impacting factors, such as for instance the traffic type/density, location, manpower, etc. The deliverable D2.5 presents the research efforts of the NeTIRail-INFRA project in the understanding of the phenomenon of short pitch corrugation. In the Section 1 of this deliverable, the literature review is presented and main challenges in terms of the physical understanding the origin of the phenomenon are discussed. Section 2 describes how the use of axle box acceleration measurement can support the detection of already existing short pitch corrugation. In Section 3, due to the fastening system being believed to importantly contribute to the phenomenon, a parametric study is presented. In the railway industry so far, the only corrective measure for delaying the growth of corrugation is grinding; thus, in Section 4 a review of the effects of grinding operations is discussed. Finally in Sections 5 and 6, the current situation of corrugation in Turkey and Slovenia are discussed. The deliverable D2.6 presents the research efforts of the NeTIRail-INFRA project in the understanding of the phenomenon of short pitch corrugation. The research within this deliverable starts with a brief description of the importance of lubrication for railways. It is emphasized that to stay competitive with other transport modes, cost and capital investments should be reduced. Reducing wear will be paving the way of reducing costs. The benefits of effective lubrication, lubrication effect including the effects of the elements of the systems, and the cost benefit of lubrication on railways will be described. The universal benefits of lubrication such reducing noise, wear, increasing asset life of rails and wheel, energy savings, reducing derailments are already known by IM and train operators, manufacturers... etc. In this report studies that have been carried out by infrastructure managers will be highlighted. Also, the cost benefits will be proven with the experiences of IMs. As TCDD prefers not to nominate the companies that it collaborates or collaborated with, the experiments conducted by using different systems was separated into ANNEX-1. Also, the names of the lubricant companies that were nominated by TCDD was separated in ANNEX-1 too. For fine tuning of some text was rewritten. Also the annexes containing the results of the questionnaires have been excluded from this public deliverable. Task description of T2.5.1 predicts that INTADER will lead the task based on the experience and needs for lubrication on their network. USFD have experience of the effect of lubrication on rail-wheel contact, especially wear rates of track and effect of reliability in lubricant application on fatigue life of rail steel, and will input this expertise. UIC will contribute knowledge of standards and their application in rail-wheel interface management across their member countries. The project will also consider the existing UIC Wheel Rail Conditioning project led by ProRail. The work will particularly consider lubrication systems appropriate for low density lines. There were some differences from description of work where UIC was supposed to contribute knowledge of standards and their application in rail-wheel interface management across their member countries. Because this data was not received on time some manufacturers contributed their standards and certificates. The project is supposed to consider the existing UIC Wheel Rail Conditioning project led by ProRail. This will be provided in the second deliverable. The work particularly considers lubrication systems appropriate for low density lines. This will be performed and explained more detailed in the deliverable D2.8. There was one deviation related to date of completion. Delivery date of the D2.7 was M18 and there was about two-month delay on this deliverable. The deliverable D2.7 needed additional data of the standards about lubrication and lubricators. 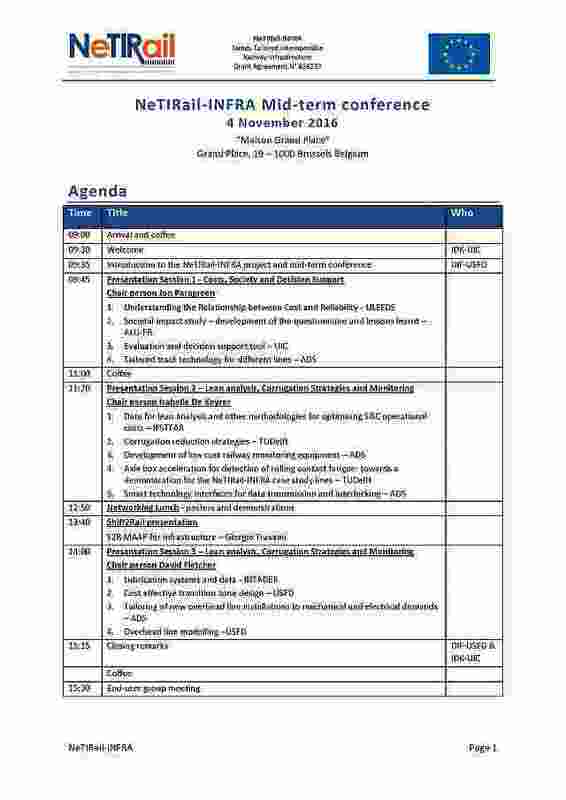 Unfortunately, at this time data was not available from UIC and therefore only the case studies in Turkey and Slovenia were considered. With the input by some other participating manufacturer the deliverable was completed.